Acid-free storage is essential for preserving your valuable images forever. These museum quality boxes will not only preserve your finest images, but will also show them off to their best advantage. Boxes have a clamshell design that allows the rear spine to lay flat for presentations. Unlike the Century Storage Box with its white interior, the Elite Box is lined in acid-free, lignin-free black paper. It also features a moisture resistant black fabric cover. Leather-like acrylic fabric outer shell. Size: 11" x 14" x 2". Constructed from acid-free, lignin-free & buffered materials. 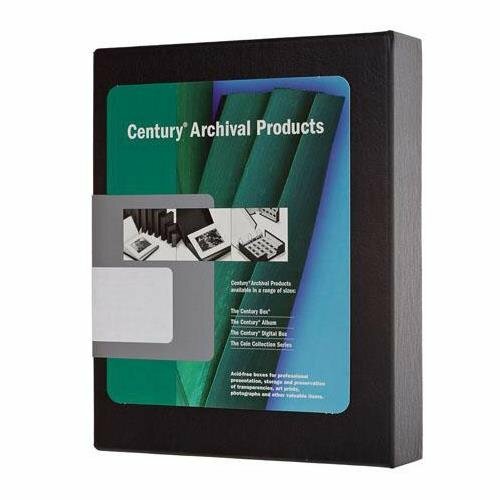 Made by Century Archival Products. Other available sizes.